In 2007, the Oxford American Dictionary gave the word “locavore” the distinction of being the “word of the year.” At the heart of the locavore movement is the idea that fresh, local food products not only taste better, but that buying local also supports dozens of producers. Today, the locavore model has spread across the country, encouraging consumers to embrace local foods. In the spirit of Thanksgiving this year, we decided to pay homage to Carroll County’s agricultural roots by putting together a locavore’s Thanksgiving dinner. Instead of rushing out to your local supermarket for a frozen turkey, consider a farm-raised, fresh bird. Generally, these turkeys are raised without artificial growth hormones or other chemical additives in their diet. And one of the advantages of buying your turkey fresh is that your bird will be processed within days of cooking and serving. Make sure you call ahead to verify availability and place your order well in advance of November 22. Remove the neck and giblets from the turkey and reserve for turkey gravy or stock (if desired). 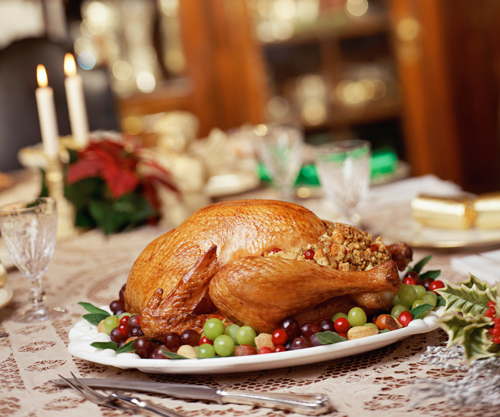 Rinse the turkey inside and out with cold running water and pat dry with paper towels. Combine milk and apple cider to make a marinade. Place the turkey on a rack in a heavy, metal roasting pan. Pour the marinade over the turkey and inside the neck and main cavities. Lift the skin and brush the marinade under the skin. Cover the pan with a large piece of plastic wrap and place in the refrigerator overnight. Heat the oven to 450 degrees F. Remove the turkey from the roasting pan and discard any marinade remaining in the bottom of the pan. Just before you plan to roast the turkey, place the turkey on its breast on parchment and loosely stuff the neck cavity with stuffing cooled to room temperature, if desired. Pull the neck skin over the opening and fasten it to the back with a bamboo skewer. Turn the turkey over and loosely stuff the main cavity. Tie the drumsticks together with kitchen twine. Place turkey, breast side up, on a metal rack in a shallow, foil-lined roasting pan and fold the wings under the turkey. Place pan in the oven and roast for 25 minutes, until juices begin to run and the skin begins to brown. Reduce heat to 350 degrees F.; roast for 1 3/4 hours. Lower temperature to 300 degrees F. Continue roasting until meat at the thickest part of the thigh registers 165 degrees F. on a meat thermometer, about 1 hour more. Although turkey has reigned supreme in the annals of Thanksgiving dinner over the decades, other types of meat have been gradually making their way onto menus across the United States. Beef, chicken, Cornish game hens, goose, venison, bison and even such exotic fare as emu (originally a native of Australia) are becoming part of Thanksgiving dinner. Carroll County is home to a number of meat and specialty livestock purveyors who can find just the cut of meat you desire for your dinner feast. For the adventurous cook, emu can yield a unique dish for the Thanksgiving table. Emu meat tastes like lean beef and can be grilled or pan sauteed. The emus at Carlhaven Emu Farm in Westminster are raised on an organic diet free from artificial hormones, and their meat (which is high in protein and low in fat) is available in ground form as well as thinly sliced and as fan-filet steaks. Preheat oven to 375 degrees F. Using a dry skillet over medium heat, toast coriander seeds and cumin seeds until fragrant, about 2 minutes. In a spice ginder, grind coriander seeds, cumin seeds, oregano, thyme, cayenne pepper, salt and pepper into a powder. Transfer ground mixture to a bowl and set aside. Rub olive oil over the surface of the meat and sprinkle spice mixture over surface of it, pressing spices slightly into the surface. Place meat on a rack in a shallow roasting pan. Place roast in oven and cook for 15 minutes. Reduce oven temperature to 300 degrees F. and roast for 1 hour or until a meat thermometer, when inserted in the center of the meat, registers 140 degrees F.
Although your local farmers market may be closed for the season, you can still find ideas and inspiration for your Thanksgiving menu at other local agricultural establishments in the county. You’ll find an abundance of late crops–such as apples and pears, fennel, cabbages, sweet potatoes and more–that can be incorporated into autumnal side dishes. Cranberry relish is a traditional Thanksgiving specialty. Divide this recipe in half to make sweet and spicy versions of the relish. In a medium saucepan, bring 1 cup water to a simmer. Add cranberries, sugar, orange juice and zest. Stir until sugar is dissolved and the cranberries begin to pop, about 15-20 minutes. Remove from heat. Divide relish in half. Add apples to half of the cranberries. Stir to combine. Add hot pepper jelly and fresh herbs to the remaining half of the cranberries. Stir to combine. Serve relishes in separate dishes. Makes 4 cups.